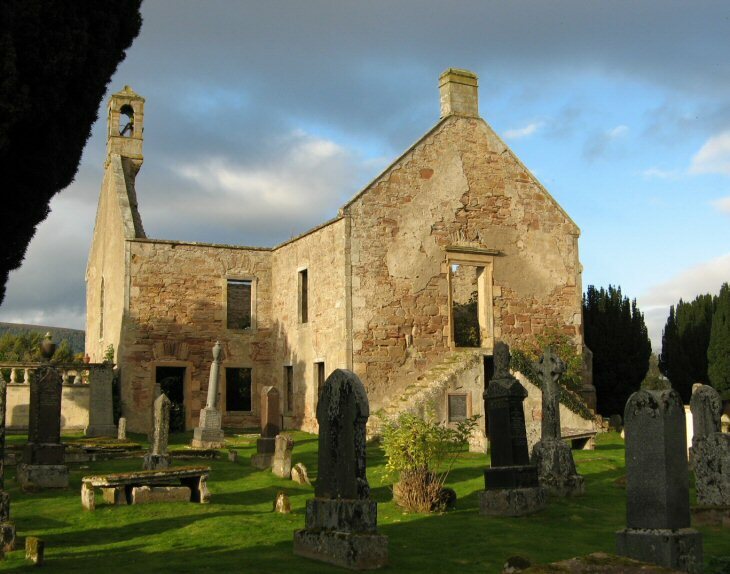 Ross & Cromarty Roots | Kiltearn Old Parish Churchyard. Kiltearn Old Churchyard is near the shore of the the Cromarty Firth, at the end of a minor road, which is accessed off the road linking Evanton with the A9. The ruined church dates from the 1790s. However, the site had been used for worship and burial centuries before. Picture Added on 13 October 2008. What a great photograph ~ quite the imposing building in it's day ! Added by on 24 July 2009. A wonderful picture of the ruined church . My great great grandfather, great great grandmother, and great aunts are buried here. A peaceful place for them. Added by Anne Catreona Callaghan on 21 December 2009. My Great great great granparents were married here on the 7th February 1824. I have visited the old church and it is beautiful - I would love to get back there one day and catalogue all the headstones. I still hope to one day find that my GGG grandfather is buried here. Added by Lyn Ross on 21 July 2010. Visited this graveyard again a few weeks ago trying to find a Mary McDonald, the daughter of Kenneth MacDonald who is buried here with the rest of the family. I noticed something unusual about the headstones-most of the flower/ plant containers were made so they fitted over the top of the headstone. Does anyone know where they can be purchased from? I asked in Inverness but no-one had one. Once again a beautiful resting place which is very well maintained. Added by Anne catreona Callaghan on 21 July 2010. My parents, Margaret and Ted Fuller, are both buried in Kiltearn churchyard. They used to live in the little cottage along the road (go straight instead of turning right, back to the main road). My mother often walked along to the ruined church. Added by Valerie Spentzos on 17 September 2010. My ancestors on my fathers side are buried here, Donald Reid married Margaret Munroe the line goes all the way down to me Roger Reid. Added by Roger James Reid on 03 January 2013. My great gran is buried here Roberta Gibb along with other family members. I loved coming here as a child as my gran Ruth Zardecki would tell me all about our family. Added by Michelle duxbury on 18 August 2013. A lovely old church. If only it could speak. Is there a record of marriages in the old school house in Nigg? Added by Ann Ross on 11 January 2016. My husbands ggrandparents were married in the old school house 1849.George Ross, Isabella Mackenzie. Anyway of finding their parents. Added by Ann Ross on 12 January 2016. I have Jack relations buried here.Isabella Stewart married Robert Jack.Children Isabella m Michael Pearson and Hector m Flora Ross.Isabella Stewart was my great aunt. Added by H fraser on 26 July 2018.